I can honestly say that I love football. But not for all the usual reasons. Yes, the games are exciting to watch, I love rooting for my team, and I do love it when we win. But the real reason is because my grown-up kids all love it, and it gives us a chance to spend a few hours together on an occasional Sunday. We are all so terribly busy, and any chance I get to see my kids having fun together is a great day for me. This year when it's time for the Big Game, I want to make something really tasty to have on hand for dessert. Since my family adores SNICKERS® bars, I decided to make SNICKERS Cookie Pots. These are basically a big warm cookie filled with deliciously melted SNICKERS candy, and topped with some vanilla ice cream. I'm happy when I have a recipe that's easy to make, and turns out even better than I thought it would. 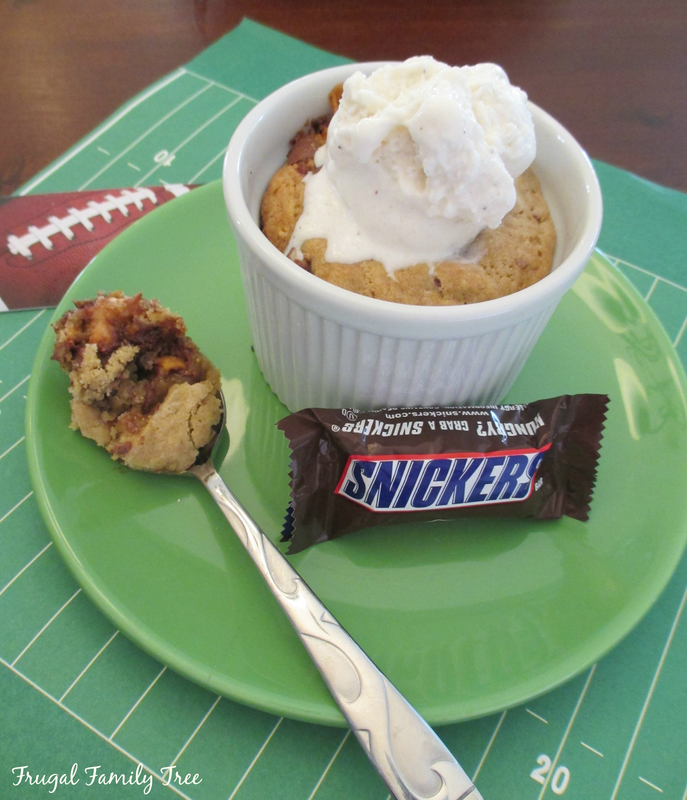 These SNICKERS Cookie Pots are melt-in-your-mouth delicious, and perfect for friends and family to eat on the day of the Big Game. Score!! 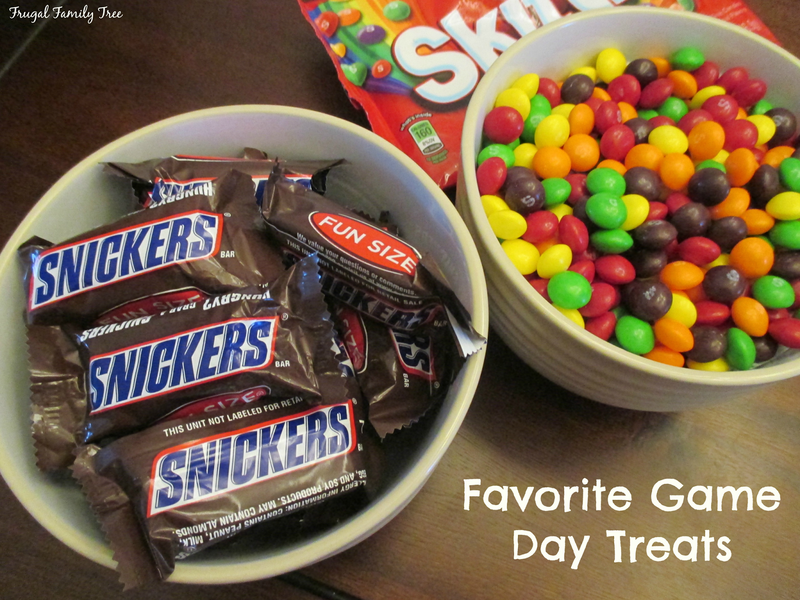 Not only are we SNICKERS fans, but everyone loves Skittles® too. I like having bowls of candy out for everyone to help themselves. My grandchildren enjoy sorting the Skittles by color, and doing counting games with them, and of course they have to all have exactly the same amount so there's no fighting. Our family has a friendly team rivalry going on because my two sons have a favorite team, and my son-in-law's favorite team is a different one. This has been going on for years, and it's funny and we have all had some good laughs, and a few lost bets, too. One thing we do all agree upon is good tasting food. 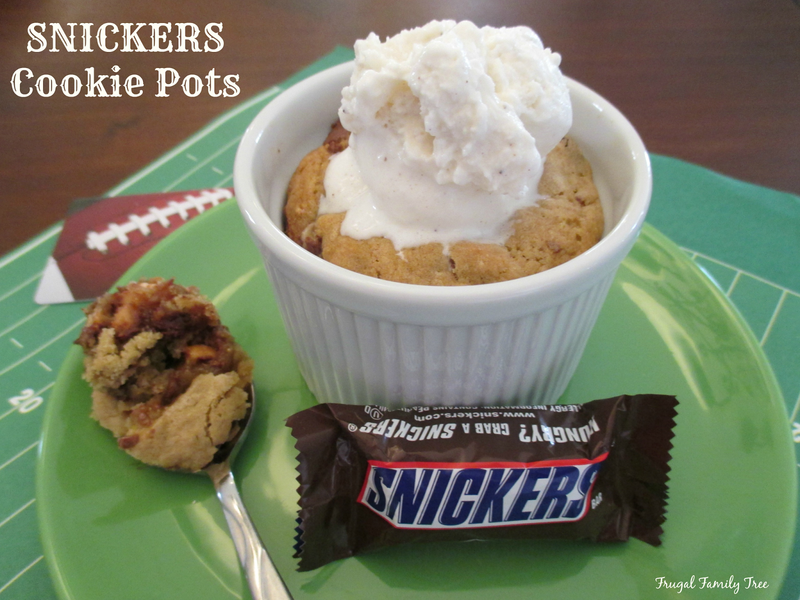 Food really is a big part of our game days, and I'd like to share my recipe for SNICKERS Cookie Pots with you. This recipe is easy to make, and you start out by slicing up the SNICKERS bars. I used fun size, but you can use the larger full-size bars if you want. Of course it's hard not to eat as you cut them, at least for me. You will need one cup of them. After you have combined the batter ingredients, stir in the sliced SNICKERS pieces. This recipe makes six servings, and can easily be doubled. Spoon the batter into 3-inch ramekins, and top with a few extra SNICKERS pieces. Bake in the oven at 350 degrees for 14-16 minutes. When they are done, they will still be gooey in the center, so be careful not to over bake them. That's what makes them taste so delicious! Lightly grease 6 3-inch ramekins with baking spray, set aside. In a medium bowl, stir together the flour, salt, baking powder, and baking soda. In a large bowl, using a hand-held mixer, cream together the butter and sugars until well blended and creamy. Add egg and vanilla extract, and beat until well mixed. Add dry ingredients and mix until combined. Stir in chocolate chips and 3/4 cup of SNICKERS. Fill the ramekins 2/3 full with the dough. Sprinkle remaining 1/4 cup SNICKERS pieces evenly on tops. Place ramekins on a cookie sheet and bake in the oven for 14-16 minutes. The centers will still be slightly undercooked when removed from the oven. Let them sit until they are no longer hot, but warm, and top with vanilla ice cream. I found SNICKERS and Skittles in the candy aisle at Walmart. I always like that Walmart offers such a big selection of candy, and in different sizes, too. Do you have any favorite Big Game inspired recipes that you like to make? Leave me a comment and let me know. I'm always looking for yummy recipes. MMMM!! I've made deep dish cookies - but never with Snickers! I know what I'm making for dessert tonight! Wow. Those look so delicious! I will have to make these ASAP. My hubby would really like these.